I have to do calculations for work frequently throughout the day, and I usually have several Windows Calculators up at one time. This retro computer can be perfect for that role. The following code is a follow-up to the previous post "Arduino Retro Computer: Command Input". I highly recommend reading that post to understand this one better. The basic premise is if the command string parsed by submitCommand() starts with the character "=", then the command string gets sent to commandMath() for processing. More advanced functions such as sin/cos/tan, power, and sqrt aren't (yet) supported. The calculator does not (yet) report hex and binary values. This is important to my work so I'll eventually get that added. At the start you can see I set the previousMathResult to 5. I then perform several additions on the running value. // Command Formatted is what the user entered with a null terminator. // commandMath so it doesn't have to reparse the leading "=". // Determine the starting number and store in the result variable. // If an operator, we'll begin with the result of the previous math calculation. // First character is terminator or operator. // to the end of the number / location of the operator. // Ensure the operator and the next digit are not a terminator. // Next character should be the operatot. // Divide by 0 protection. // pointer to the next valid operation. // Completed processing the string. Format the result and display! // Can't use snprintf - Arduino does not support floats in sprintf. I've created a ScreenModel class that contains a display buffer, command buffer, and functions to interact between the two. My current plan is to have 2 operating modes: OS Mode and Program Mode. If a BASIC program is actively running, then the screen is in Program Mode, otherwise it's in OS Mode. The mode determines where keyboard inputs are processed. I can define multiple screens and switch between them using the PageUp and PageDown keys. (Similar to how command line Linux works with the function keys.) 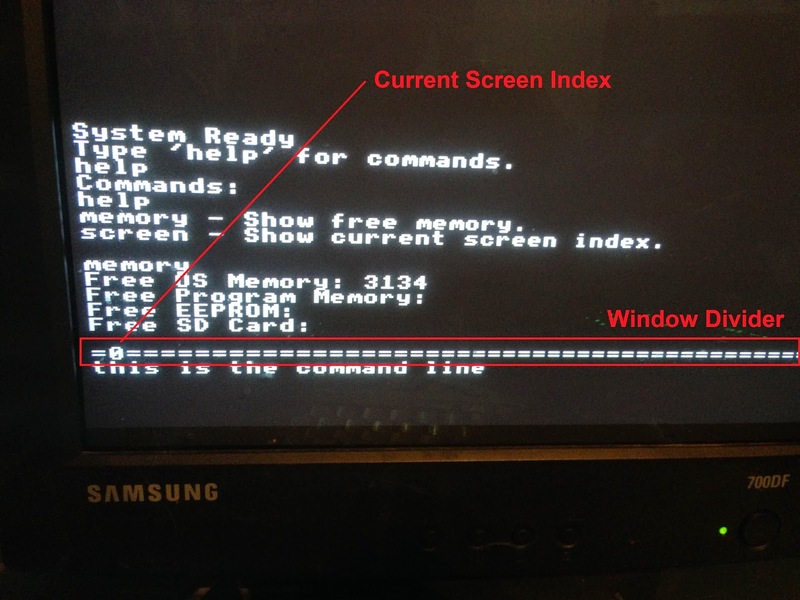 That way a BASIC program may be running on screen #1, but the user can switch to screen #2 and enter system commands and/or execute a second program. Please note: All of this is very subject to change. Also, the following code just highlights the command input; we'll cover the video output at a later time. If anyone is curious my Arduino Sketch size is now 16,856 bytes (of a 258,048 byte maximum). I've got plenty of room for additional development! We covered this code earlier in the keyboard posts, but here's a quick recap in how we initialize the keyboard for input. We can poll the keyboard input with keyboard.available() and keyboard.read() - which we'll do in the primary Arduino loop() (covered below). // Initialize the serial input with the computer (for debugging). At this time, I'm defining only 2 screens. It's enough to test the Arduino functions without swallowing up even more of the limited RAM. I may keep it at 2 or I may increase it. The plan for this operating system is to be multitasking, not multithreading. Multiple user programs will be able to be executing at the same time, but it's all on one thread. The OS will have to alternate between the screens to process the BASIC commands. There are many more uses of pointers throughout the code - especially when handling strings. If you don't know what they are, then I highly recommend you learn about them. (So far I've used them in very simple situations in this project; they can actually be quite powerful.) Unfortunately pointers have a bad reputation, but be cautious of anyone that tells you to "never use" a certain coding feature. // Keep track of which screen is active to know where to send inputs to. // Initialize each of the screens (pass in the index of the screen to the constructor). // Set the default screen to index 0 and trigger a screen change. The main program loop monitors for input from the keyboard. If it's a Page Up or Page Down, then it switches the active screen. Otherwise, it sends the keyboard input to the active screen for processing. // Then check keyboard input for the current screen. // If the current screen is in OS mode, process inputs as OS commands. // If the current screen is in Program mode, send inputs to the Program. // Check if need to swap between OS screens. // Switch to the next screen. // Switch to the previous screen. // Send the command to the screen. .. More init stuff ..
.. A whole bunch of additional variables and functions described below ..
Each screen needs to know which operating mode it is in to know how to process commands (and know if it's actively executing a program!). I've defined a simple enumeration of the operating mode and a byte to store the state. Keyboard presses that are received in the main loop() are passed into the ScreenModel function inputKeyboard(inputKey). inputKeyboard(inputKey) will relay that input to either inputKeyboardOS(inputKey) or inputKeyboardProgram(inputKey) depending on the operating mode. inputKeyboardProgram(inputKey) hasn't been developed yet. At this point I just have a place holder such that if ESC is pressed it exits out of program mode. inputKeyboardOS(inputKey) will submitCommand() if enter is pressed, clearCommand() if ESC is pressed, removeCharacter() if delete is pressed, or addCharacter(inputKey) if a character / digit is pressed. // Keyboard input intended to be processed by the OS. // Submit the current command. The lower portion of the screen is the command window. It's two lines, 50 characters per line, supporting 100 characters of input total. Each screen has its own command array. We want the video output to specifically draw empty characters (to clear out what was previously drawn). Thus nowhere in the 100 characters will there ever be a null terminator (0), it will be an empty space instead. You will see many calls to drawCommandCharacter to specifically clear a character from the output. Again, video output will be described in a later post. For better or worse, the entire command array can be filled; meaning there is no null terminator (not even at the last index of the array). When we have to do additional processing on the command array, we'll add in the null terminator as necessary. I'm not super excited about this approach so it's very likely to change, but it is how I wrote it a while ago (this is some of the first code I wrote for the Retro Computer, before I started the blog). // Character or digit was typed, add it to the command array. // Delete key was pressed, delete from the command array. // Special case if we're on the last character. // Delete the last character but don't decrement back. // Delete the previous character and decrement back. When an operating system command is submitted (by pressing enter), I want to display it in the output window, execute the command, and clear the input. Ultimately I also want to store the command in a history so I can jump between previously entered commands. My next post will dive into the details of a few of these initial commands. I then may address the video output. // Display the command entered in the output window. // Empty command, just add a space to the output window. // On the first loop through, copy the first 50 characters (numberOfOutputColumns).